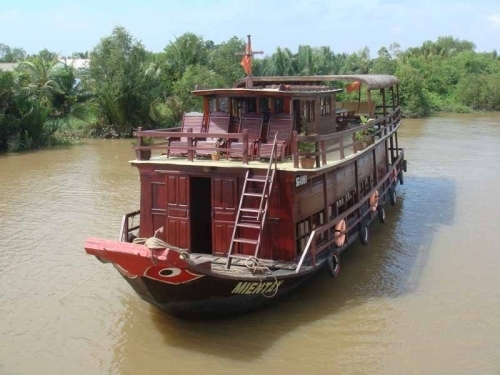 Mekong Delta Tour is one of the most attractive tours in Vietnam. Within 7 days 6 nights, not do you only visit Cai Be floating market, handicraft villages, Sadec market, Sadec flowers village and the daily life of local people in Long Xuyen floating market, but you also have an indeed interesting experience in Phnom Penh, the Wats Phnom, National Museum, Siver Pagoda, Royal Palace… of Cambodia on Le Cochinchine Cruise. Why don’t you contact Viet Fun Travel to book this great trip? Explore capital of Cambodia - Phnom Penh. Visit ancient capital of Angkor Thom. 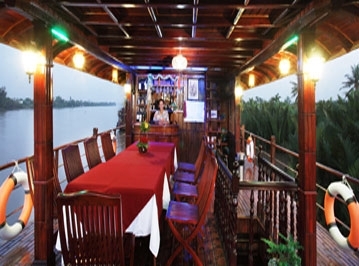 Arrival Mekong Delta, and embark our cruise and welcome drink on boat. We take a morning junk trip to Dong Hoa Hiep Island and go ashore to visit the French Gothic Cathedral and colorful port area, with its colonial buildings, delightful flower gardens and local coconut candy and rice paper manufacturers. The LeCochichine boat set sails forward Sadec and moor midstream for the night. Visit the Sadec local market, following the tracks of French novelist Marguerite Duras. Walks/Cycle amongst the ever blossoming Sadec flower village and local industries. Visit Culao OngHo and enjoy the scenery and walk /cycle to visit villages the island, passing by farmers, children, villagers tendering their daily load. See local farmers trading their produce on the water as they have done for centuries. You will have a unique opportunity to discover a side of Delta life that few travellers experience. Boat Cruise through the floating fish-farm village producing tons and tons of fish beneath hundreds of floating houses, discover the ethnic Cham village with famous Mubarak Mosque and observe local women at their traditional weaving. Enjoy the aperitif on the sun desk and taking in view of the the river. This morning we will have a boat ride from Chau Doc to Phnom Penh departing at 7am. The boat takes us along the Mekong River. It continues on to the Vietnamese (Vinh Xuong) - Cambodian (Kaom Samnar) border and then to Phnom Penh, capital of Cambodia. The journey takes approximately 4 hours. Arrival transfer our hotel in Phnompenh, the capital of Kingdom of Cambodia. A visit to Phnom Penh is a very interesting experience indeed. It is a city with an interesting pulse and it gives you a very true taste of Asia. We will visit the Wats Phnom, National museum, silver Pagoda and Royal Palace. Overnight at Sunway hotel**** in Phnom Penh, deluxe room. This morning there will be a transfer to Phompenh airport to Siemriep FT 990 0645 0735. ArrivalSiemriep, transfer to the hotel .Visit Prasat Kravan with its unique brick sculptures and Ta Prohm. One of the area's most beautiful temples, Ta Prohm has been relatively untouched since it was discovered and retains much of its mystery. Its appeal lies in the fact that, unlike the other monuments of Angkor, it was abandoned and swallowed by the jungle, looking very much the ways most of the Angkor temples appeared when European explorers first stumbled upon them. Visit as well Takeo, Chau Say Tevoda and Thommanon. Dinner and overnight at Prince d’Angkor hotel , deluxe room. In the morning, visit the most famous of all the temples on the plain of Angkor: Angkor Wat. Thetemple complex covers 81 hectares and is comparable in size to the Imperial Palace in Beijing. Its distinctive five towers are emblazoned on the Cambodian flag and the 12th century masterpiece is considered by art historians to be the prime example of classical Khmer art and architecture. Angkor Wat's five towers symbolize Meru's five peaks - the enclosed wall represents the mountains at the edge of the world and the surrounding moat, the ocean beyond. Afternoon visit the ancient capital of Angkor Thom (12th century). See the South Gate with its huge statues depicting the churning of the ocean of milk, the Royal Enclosure, Phimeanakas, the Elephants Terrace, the Terrace of the Leper King and Bayon Temple (unique for its 54 towers decorated with over 200 smiling faces of Avolokitesvara), until sunset. Tonight we will enjoy diner with traditional Khmer folk performance of Apsara.Overnight at Prince d’Angkor hotel in Siemriep, deluxe room. At leisure to visit the market or "Les Artisans d'Angkor - Chantiers Ecoles" of Siem Reap (if time permits). Transfer to Siem Reap International Airport for departure flight to the next destination. 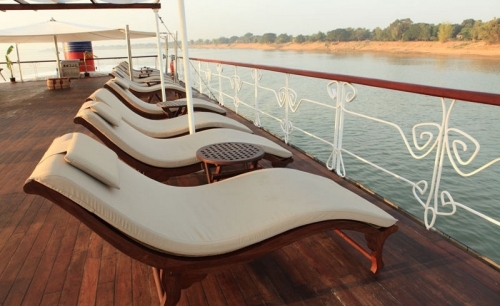 Finish Mekong Delta Tour 7 Days 6 Nights On Le Cochinchine Cruise - Exit to Cambodia. 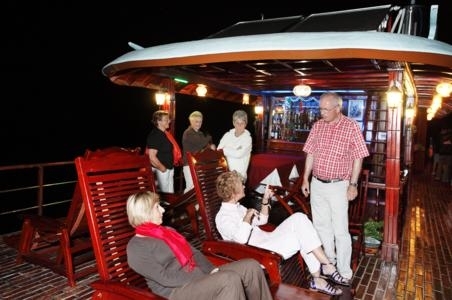 Standard Type: All boat cruise Lecochinchine with meals, Boat ride from Chaudoc to Phnompenh-Phnompenh -Siemreap. 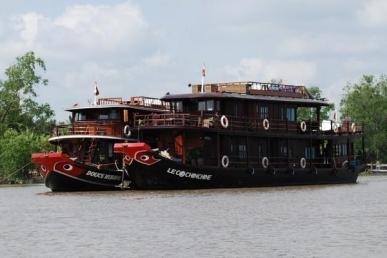 All accommodation on the Le Cochinchine boat and at the hotels ( Sunway hotel, Prince Angkor hotel), Meals as indicated. Air ticket Phnompenh - Siem Riep, Admission fees and permits where applicable , Land transportation. Airport transfers, Service of crew and English speaking guide on board. Exclude the tranportation to Sai Gon. Pre/post trip arrangement, Beverages, Travel insurance , Visa fee (Visa fee on arrival at Cambodia border: 25USD, 1 photo 3x4cm). Other personal expenses. Deluxe Type: We will pick up in Dist 1, Ho Chi Minh City.